Terraform Mars and make the hostile planet habitable for humanity. Seed the surface of Mars with various lichen, grass, shrubs, or trees and watch as they begin to turn the Red Planet green. 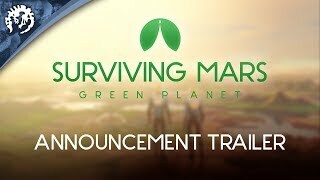 Make Mars habitable and build a second home for humanity in Surviving Mars: Green Planet. Terraform Mars and make the hostile planet habitable for humanity. Each decision you make while managing your colony can affect the Terraforming Parameters, which include the Atmosphere, Temperature, Water, and Vegetation, and ideally brings them closer to habitable levels. Monitor your progress on a planetary scale with the Planetary Overview UI. Seed the surface of Mars with various lichen, grass, shrubs, or trees and watch as they begin to turn the Red Planet green. Low maintenance plants like Lichen can improve the soil quality to help more complex plants grow while Trees produce high seed yields for your colony to harvest. Be sure to monitor your soil quality levels to keep your plants healthy and growing. Take on seven challenging Special Projects like melting the polar caps, capturing ice asteroids, launching a space mirror, and more to begin shifting the Terraforming Parameters. Be careful, these projects will have a lasting impact on the planet and can trigger natural disasters! Construct seven new buildings that can help you terraform the planet or capitalize on the changes. Use the GHG factory to release greenhouse gasses into the atmosphere, the Forestation Plant to boost vegetation production, the Water Pump to fill lake bed, and more. Terraforming a planet can have unexpected consequences. If you release too many greenhouse gasses into the atmosphere you can trigger acid rain which reduces soil quality, or if an asteroid slams into the planet it will cause a Marsquake that can disrupt your colony’s production.